Was on the Singapore National Team for 5 years and competed at the Junior and Senior level Internationally. 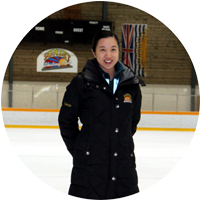 During the 5 years she participated at Jr. Worlds, placed top 4 at the New Zealand Winter Games in Junior, and placed 12th U.S. International Classic in Senior. Locally she came 1st at B.C. Winter Games in Pre-Novice and 5th at BC Sectionals in Junior.